Pioneers in the industry, we offer tray dryers and process dryer from India. Keeping in sync with time, we are able to offer Tray Dryers to our respectable clients. 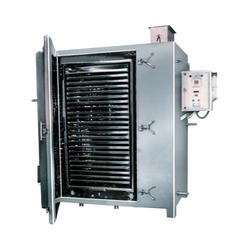 The offered range of tray dryers is made utilizing high-grade raw material and innovative techniques in strict compliance with the international quality norms and standards. Moreover, the offered range of tray dryers is applicable in baking, drying, preheating in chemical, food, dyestuff, and pharmaceutical.